The formation mechanism of the Adirondack Mountains in upstate New York has long posed a geologic mystery. A few mechanisms have been proposed, but until recently tools for evaluating them were not in place, according to researchers from the University of Massachusetts Amherst. Now, using an advanced seismic imaging method and data available only in the past five years, the researchers have constructed a detailed model of the tectonic plate – the crust and the uppermost rigid mantle of the lithosphere under the northeast United States – down to about 62 miles (100 kilometers), in which they discovered a “pillow” of low-density, relatively light rock material. They say a column of this lighter material appears to have squeezed up under the Adirondacks, possibly expanded by heat, to form the dome-shaped mountains. Details appear in a new study in the American Geophysical Union journal Geophysical Research Letters. The question of how different mountains formed has been around for many years, Yang said, and for very large features such as the 1,500-mile Appalachian Mountain range, tectonic plate boundary collision processes are relatively well understood. But for mountains that lie entirely within one fairly stable tectonic plate, known as intercratonic mountains, uplift mechanisms that are not boundary related, are less clear. Schematic illustration of the lithosphere structure in the northeastern United States. The thick red arrows depict the proposed mantle convection and asthenosphere flows based on seismic tomographic imaging. Illustrations here are not to scale. LAB represents the lithosphere-asthenosphere. For this work, he and Gao used data from the National Science Foundation’s EarthScope program, a portable array of seismometers deployed across the U.S. and moved systematically from west to east over a number of years in the Lower 48 states. Data in the northeastern U.S. has been publicly available since 2013. Before EarthScope, collecting such data was “hit or miss,” Yang said, because seismometers were unevenly and sparsely distributed. “Instead of using earthquake waves, our technique extracts seismic waves from background noises between each two stations, taking advantage of the densely distributed seismic stations. You also need a way to handle the process of a huge amount of data,” he added. For this, they used the Massachusetts Green High Performance Computing Center in Holyoke, Massachusetts. Based on their observations, he and Gao now believe that between 90 and 120 million years ago, the tectonic plate under the northeastern U.S. was passing over a geologic “hot spot,” which is now under the western Atlantic Ocean, off the coast of Massachusetts, known as the New England seamounts. Some studies suggest that the New England region was uplifting at around that time, which could have resulted from hot spot heating. 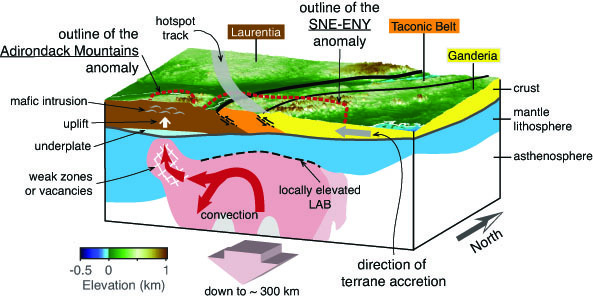 The hot-spot activities may also have contributed heat to processes forming the Adirondack Mountains. In addition to funding from NSF and NSF’s EarthScope program, this work was supported by start-up funding from UMass Amherst to Gao’s seismology laboratory. — Jan Lathrop is a science writer in the UMass Amherst Office of News and Media Relations. The post originally appeared as a press release on the UMass Amherst website. Although it currently is not at a plate boundary or hot spot, it could have been at one time. It could be that it is a result of the combination of these processes along with other geological processes that have happen over a long period of time. These processes might have seized to exist now, but evidence of then is becoming aware due to different scientific processes. Is there any geological processes happening currently that could be changing the features in the near future? Yup, there is that hot spot that is or was, not sure if same or different yet, that is welling up underneath Massachusetts, New Hampshire, Vermont and maybe even Maine. And then there is one right out in the ocean right of the coast as well, uplifting ocean crust. Though I’m not sure if their two distinct hot spots or the same, I get mix info. via news and scientific journals. Though I think the ocean one is the main culprit in forming the other one if they are two distinct different ones. It is also the cause for forming or at least aggravating the New Madrid fault, since it used it and its faults all the way up western pa, through the spot that other hot spot is forming and then down into its current spot in the ocean. It might have melted through the Falleron plate horizontally, if ever have time take a look at the Falleron plate nasa image with a us map overlay after making that hole in it in the west with its yellowstone hot spot helper. So is something gonna happen when the earth and its plates goes super fast and active, probably, now how soon, God only knows.